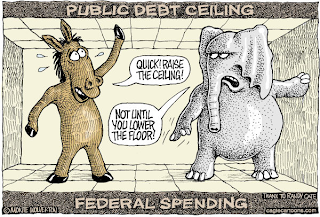 Home > Politics > "Government Shutdown 2015" to Start Oct. 1! 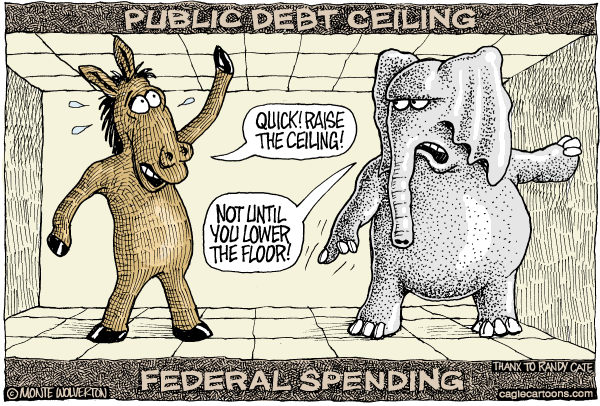 "Government Shutdown 2015" to Start Oct. 1! Government shutdown 2015: The full cost of a government shutdown that lasted 16 days in October 2013 was staggering – it delivered a $24 billion blow to the U.S. economy and taxpayers. Standard & Poor's said the shutdown equaled some $1.5 billion a day and "shaved at least 0.6% off annualized fourth quarter 2013 GDP growth." Moody's Analytics reported similar numbers, saying the shutdown cost $1.4375 billion per day, for a $23 billion wallop to U.S. gross domestic product. The 16-day shutdown also sidetracked the creation of an estimated 120,000 new jobs, according to an October 2013 report from the Council of Economic Advisers. It triggered government furloughs that ultimately amounted to 6.6 million days' worth of federal employment spread over several agencies. Furloughed workers were paid retroactively ($2.5 billion total, according to a November 2013 report from the Office of Management and Budget). Of course that means the taxpayers were the big losers – they lost out on worker productivity, and the government didn't actually save any money by suspending paychecks. "The October 2013 government shutdown came with a $24 billion price tag as hundreds of thousands of furloughed workers took home smaller paychecks and small businesses were hobbled by frozen government contracts and payments," Money Morning Chief Investment Strategist Keith Fitz-Gerald told his Total Wealth research service readers on Sept. 18. "Consumer confidence went into the proverbial toilet and quarterly GDP growth fell from 3% to a middling 2.4%." Now, exactly two years later, we're about to do it all over again. The first day of fiscal year 2016 is on Oct. 1. That's the deadline for funding. And in fact, House Republicans approved a standalone measure to defund PP for one year on Sept. 18 – the first step toward a government shutdown this month. "We stand yet again on the verge of another government shutdown," Fitz-Gerald said. "This time the bickering centers on funding related to Planned Parenthood, which has been linked to the appalling sales of fetal body parts in recent months, while other legislators insist on a planned multibillion dollar tax hike for private equity managers." "The way I see it, wingnuts on both sides of the aisle are playing chicken with an $18 trillion economy and world markets once again." Estimated Cost of "Government Shutdown 2015"
Defense contracts dropped by nearly a third, with a 40% decline in spending, according to the Office of Management and Budget (OMB). According to Small Business Administration data, roughly 700 applications for $140 million in small-business loans could not be processed. The OMB estimated businesses that rely on tourism lost out on roughly $500 million in visitor spending. In Washington, D.C., alone, there was a 9% decrease in hotel occupancy during the first week of the October shutdown, according to the official tourism corporation of D.C, Destination D.C.
An estimated 200 applications for oil and gas drilling permits went unprocessed. The IRS reported a backlog of 1.2 million verification requests on standstill. The shutdown cost national parks and museums $500 million in admission fees and concession stand sales. But the financial impact went much further. Some 700,000 people visit parks every day in a typical October, and communities surrounding the nation's 401 national parks see about $76 million a day in total visitor spending that is lost during a government shutdown, according to the National Park Service. Government permit offices across the country stopped collecting fees, government contractors stopped receiving checks, and critical research projects ceased. Several military contractors remain in limbo as uncertainty lingers about big projects. More than 2 million liters of alcoholic beverage shipments sat at U.S. ports because the Treasury was not able to issue export certificates. A delayed opening of the Alaskan crab fishing season cost fisherman thousands of dollars a day in lost revenue. "Not surprisingly in the last government shutdown, mainstream investors were spooked by headlines highlighting the unfolding doom associated with Washington's incompetence," Fitz-Gerald said. "Nowhere was that more clearly defined than in defense stocks, with some of the bigger players losing up to 7% of their market capitalization in just three days." It caused irreparable damage at a number of government agencies and again called into question America's ability to control its finances. Basically, the United States lost some of its swagger thanks to D.C. drama. The government was closed because our country's leaders couldn't fulfill one of their most central responsibilities: enacting a budget. Washington lawmakers chose politics over people as they wrangled over a deal. And they're about to do it again. "Financial buffoonery has been a part of government since the dawn of time, and another shutdown is par for the course," Fitz-Gerald said. Fitz-Gerald gave Total Wealth readers three investment opportunities that will arise from "Government Shutdown 2015." "The last government shutdown, as costly and embarrassing as it was, created some quick double-digit profit opportunities for savvy investors," he noted. You can access those picks here, for free. "This time around, you'll be prepared even if the government isn't."